Yamamoto Soseki was well known to Japanese tenkara fishers. He introduced tenkara to mountain-stream anglers through his many books and articles. Based on one of his articles of a fishing magazine (Ancestry of Tenkara, The cutting edge of mountain stream fishing 1988, page 68-73, published by Weekly Fishing Sunday), this report has been prepared to introduce Soseki’s tenkara technique and various tenkara techniques in different districts in Japan. Although that article is a bit old, I think this report provides you with some interesting information on Soseki and many types of tenkara techniques. 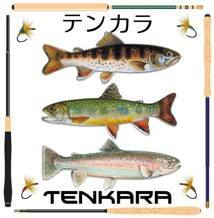 Twenty years ago, when the above-referenced article was published, every mountain-stream angler knows that “tenkara” is a name of a technique for fishing mountain-stream fish with a fly. However, just twenty to thirty years before that time, tenkara was a fishing technique that was performed only in limited districts and had been handed on from one generation to another in respective districts by only a limited number of people. The fishing technique and the name for tenkara had a large variety among those districts. This variety will be described latter. Tenkara had long handed on in Kiso district in Nagano Prefecture since old times. Its techniques and fly patterns were well known as an orthodox mainstream of tenkara. The fly patterns in Kiso had the collectively theorized components for practical use to fish amago, which was called “tanabita” in that district. Dr. Sugimoto, who ran an internal medical clinic in Fukushima in Kiso, was Soseki’s master of tenkara. After Soseki learned tenkara by Dr. Sugimoto’s book, he visited him to have his face-to-face training. It was summer in 1964. According to the technique of traditional tenkara there, they fished the mid deep to near surface region with a fly immersed in the water, and it was very difficult technique especially to beginners. That technique was all the same as bait fishing except using a fly instead of a real bait. The most difficult point is in how to detect a fish bite. You needed to have a good skill to hook a fish upon a glance at a fish turning around in the water. Why had that difficult technique been handed on? In those days, it was practical to immerse a fly in water. There were two reasons for that: first, a natural material fishing line looks so transparent in water that it is difficult for fish to find it; second, a natural material fishing line has unevenness in thickness, and the water prevents as a cushion the fishing line from breaking due to an instantaneous large force when hooking a big fish. When a nylon fishing line was put on the market, it replaced the conventional natural material fishing line. It was light, strong, and chemically stable. On response to the emerge of the nylon fishing line, Dr. Sugimoto conceived a new tenkara technique, improving the traditional tenkara technique. His new technique had two major features. One was to lure a fish out to the surface and to hook it there. This thrilling technique was created owing to a fine but strong nylon tippet. The other was a simple style of fly. In the water, an unsophisticated fly is easily found out to be an artificial bait, and therefore, a fly has to look like a real bait. However, on the surface, fantastic flies have the following advantage. With this new technique, a fly is shown off to fish through a bail of the water. The fish sees upwardly the fly though water from deep in the water, in other words the fish looks toward the bright place from the dark place. In the morning and evening, the situation is especially enhanced, thus a fantastic fly is more effective. Dr. Sugimoto focused on this point and came up with a fly only having a simple hackle and body, setting up the “Wing Vein Theory” which insists that the veins of the wing are important in flies because only the veins can be seen if you see the wing of a mayfly by transmitted light. The fishing is inherently distinctive in different districts. The same kind of fish has different names, and the fishing techniques are different. Those respective techniques have been handed on in respective districts, and tackles and fishing rigs have been locally developed, and are thus locally distinctive. However, most of the differences in techniques and tackles seem to have been lost due to printings and visual materials. Printings and visual materials such as TV help a fishing technique of some people or some district to prevail as a standard technique. In the northern area of Tohoku (meaning “north-east”) district is the technique in which three to five flies are tied like tree branches, and the flies are dragged on the surface. This technique is called “Mosquito Fly Fishing”. In Nikko, Gorocho fly has been well known as a fly for the mountain stream fishing, and it is famous as a pattern of fly instead of as a fishing technique. As the name of the fly implies, this fly is made similar to a gorocho (a dialect word representing an adult aquatic insect of some kind). The features of mountain stream fish especially iwanas depend on the rivers where they live, due to a stream size, properties of water, bottom stones, vegetation in the river basin, brightness, and so on. Therefore, their feeding habits can also differ in different streams. Thus, the following situations can occur. Earth worms are effective in A river, but in B river they are not at all effective, instead aquatic insects are a must. Of aquatic insects, caddices are effective in C river, but mayflies are effective in D river. The same thing goes with flies, and we have to prepare unusual flies for rare use in addition to our favorite flies for regular use. Regarding this troublesome issue, there are two different convincing assertions A and B, and they make this issue more troublesome. To make this difficult issue simple, let’s discuss bait as an example. Assertion A insists that the bait that the fish usually have is better, and to the contrary, assertion B insists that an unusual bait is better. You can buy either assertion. Although the two assertions are opposite to each other, both can make sense and are persuasive to unconfident anglers. The same thing goes with flies, and thus you have trouble to decide what kind of pattern to use. 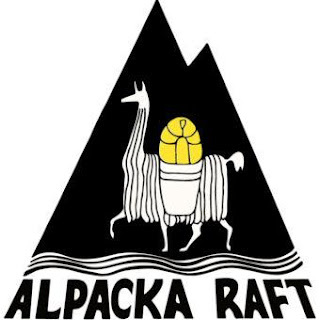 The best pattern depends on uncertain conditions such as weather and water level in addition to the aforementioned constant conditions such as properties of water, bottom stones, and vegetation of the river bank, which relates to the kind of bait inhabiting there. In this regard, you can learn a lot from the visual features of traditional flies that have locally long been handed on. From this point of view, Gorocho Fly is distinctive in Nikko district. In Yamanashi Prefecture is a technique called Taiko (meaning “drum”) Fishing. The reason why it is called by that name is that an angler changes points while drumming the water surface with a fly. It is quite an exciting technique. A fly is not shown to fish for a long time, instead it is repeatedly shown for a very short time to confuse the eyes of a fish. After showing off the fly that way, the fly is presented on the water for the fish to bite. Such a manipulation of fly reminds us of an image of a dragonfly dipping its tail in the water to lay eggs. In the southern part of Kyusyu Island is a technique that is totally opposite to Taiko Fishing in Yamanashi Prefecture. In this district, yamame is called madara (meaning “spotty”) or enoha (meaning “leaf of nettle tree”), and there is a tenkara technique called Hashirakashi (meaning “to sweep quickly”). The presented fly is manipulated so as to scratch the water surface quickly. In Shidara County in Aichi Prefecture is a tenkara, which has long been handed on. 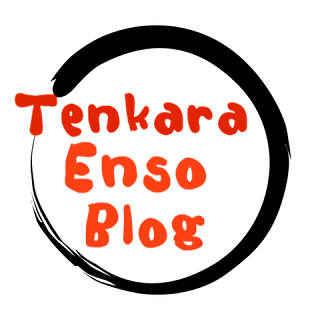 That tenkara is basically the same as Kiso tenkara, but Kiso tenkara is thought to be older. In Fukui Prefecture is also a tenkara technique, and Soseki actually saw this technique in the Itoshiro River in 1965. The angler was old and nearly blind due to cataract but waded very lightly, jumping from one stone to another while casting at short intervals. His line system is the same as that of Kiso tenkara. He casted and picked up after he presented a fly and counted “one, two, three”. With this technique, a fish is most likely to bite the fly at the moment the angler counts “three”. It was a repetition of counting “one, two, three” and not very exiting, but the angler caught far more fish than Soseki, Soseki was a beginner at that time, though. In Totsukawa Village is a bit different technique. It is a technique using a level line. 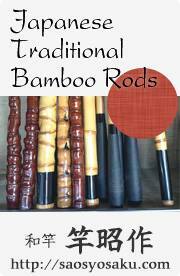 It is called Tobashi (meaning “casting”) and has been performed by forestry work workers. The line system employs a 10lb to 14lb nylon line and about one meter of a thinner tippet tied to the end of the level line. In addition, an ear of a dead pampas grass is tied on at the upper part. Its weight helps casting, and it works as an indicator as well. Mr. Takekabu in Owase City has taken over this orthodox technique of the level line tenkara and is developing the technique. His technique is better to be called Takekabu Style than to be called level line tenkara. His level line is eight to ten meters long, which is much longer than typical level lines. He can easily cast this long line without any indicator or weight. The tapered line is easy to cast due to its tapered shape, but a long level line needs more skill and more physical strength to cast. The reason he still sticks to his style is that hooking rate is very high with his style. Judging from Soseki’s experience, you can hook typically seven out of ten fish but miss three fish. However, Takekabu Style is said to hook all the ten fish. Why there is such a difference? It is because you can stay away from the spot owing to that long line, and a fly can be presented on the water surface naturally enough. However, it is not good for bushy small streams, and in addition you have to have a good eye sight. Deep Mino and Hida district is a Sakasa Kebari. Since its hackle is tied in the opposite direction to normal flies, and it looks like swimming in the water when the line is tensioned. 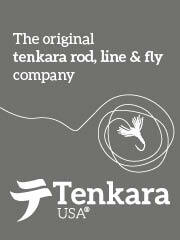 Tenkara has long been said to be difficult, and Soseki believed the same way at first. But through his experience, twenty years for bait fishing and another twenty years for tenkara, he said tenkara was simpler and easier.